Instrument exploration, instrument play-alongs, creative movement, story time, circle dances and instrument exploration, games, bubbles, parachutes are all among some of the many wonderful activities that we will lead at your child’s party. The Birthday child will be the center of the party!! We’re the experts when it comes to making music and making children smile! We will provide a completely interactive, totally FUN experience for ! 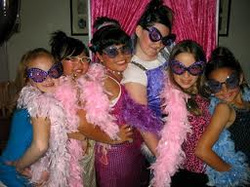 We tailor each party specifically for each age group from 2 to 7. 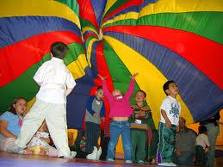 • A personal consultation to discuss your birthday party needs. • 1 hour of entertainment on Party Day, which includes instrument play, dancing, movement, singing, parachute fun, bubbles, games and more. • 1 hour - parent monitored birthday party. 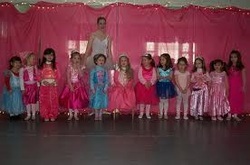 • Ave Maria Dance Academy will also provide each guest with a certificate for one free dance class of their choice. Call: (239) 261-2606 to Book Today! 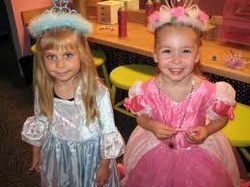 Our Fairytale Princess Birthday Party is sure to be a hit for your little Princess! Every little girl dreams of dressing up in a beautiful princess gown and pretending to be a beautiful princess for the day. We will provide everything to help turn your Princess's dreams into a dream come true. Special attention will be given to every little detail; arriving guests will be transformed magically into Fairytale Princesses with a dusting of magical fairy dust. The transformation begins with a light application of make-up and nail polish. Then it is off to our collection of princess gowns where many beautiful dresses abound. Accessories of crowns, beads and boas are just the final touch to any Princess's delight! Then it’s on to an assortment of regal activities to entertain including a Princess Parade and Coronation, with the crowning of the official Birthday Princess! Knights and Princes are always welcome to attend! • 1 hour of entertainment on Party Day, which includes a mini-makeover, princess dress up, parade and coronation. A swashbuckling Pirate Adventure awaits your little buccaneers with this perfect Pirate Buccaneer Bash Dress-Up Theme Party. Aye, Aye Matey! What young man hasn't wanted to be a pirate? Dress like one? Find the buried treasure? Play capture the flag? Pirate costumes, face painting, swashbuckling games and tried and true pirate activities guarantee your party will be worth its weight in GOLD!!! A great party theme for any adventurous mate! There'll be plenty of pillage and plunder for all! Aaarrrggh!!! • 1 hour of entertainment on Party Day, which includes pirate costumes and pirate themed games. What better way for an aspiring ballerina to spend her birthday than through a magical journey of dance and imagination? Your ballerina princess and her friends will embark on a journey through the enchanting world of ballet in celebration of her birthday. A special birthday tiara will be bestowed upon the birthday ballerina! Once the honored tiara has been donned, it is time for the birthday girl and guests to begin their own ballet adventure! 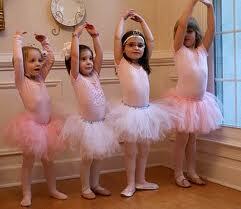 The dancers will be led through an age-appropriate ballet lesson. Younger dancers will enjoy imaginative creative movement exercises which will help them to grow tall like blossoming roses, stretch out like limber kittens, and dart through the air like dainty butterflies. Older children will appreciate more advanced ballet exercises and will create their very own mini ballet suite which they will perform for attending parents. • 1 hour of entertainment on Party Day,including a "real" ballet lesson, including reaching and stretching exercises on the floor. Barre exercises (for ballerinas 6 and older). Creative movements in the center of the room including port de bras (beautiful arm exercises), jumps, turns, leaps, skips, bourree runs, and other allegro ballet movements. • Special tiara for the birthday girl. 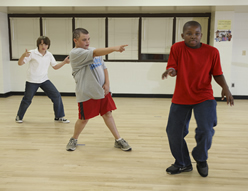 Cater to the dancer in your child with a Hip hop dance party where party guests get 1 hour of Hip hop dance instruction by a Hip-Hop instructor. Party goers will learn some basic hip hop steps to upbeat hip hop music (don’t worry- only clean lyrics and tasteful moves will be taught.) At the conclusion of the lesson the dancers will bring it all together and perform a short dance showcasing their new moves and individual talent! 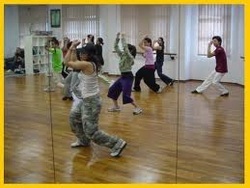 *Each Hip-Hop lesson will be specially designed and age appropriate. • 1 hour of Hip-Hop instruction incorporating both Hip Hop technique and choreography on Party Day. • Each child receives Personalized CD to take home with 12 pre-requested songs to be played during the party. An All That Jazz Birthday Party is a great way to celebrate that special day! Party goers will be taught exciting jazz dance choreography following a high energy warm-up! 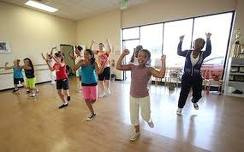 Depending on the age group the lesson will range from learning short, lively dance combinations to a full Jazz dance routine that the kids can take home & show every body! 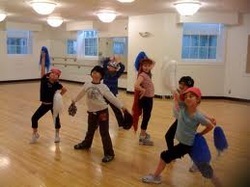 Dancers will be encouraged to add their own personality to make each new step they learn unique and fun! 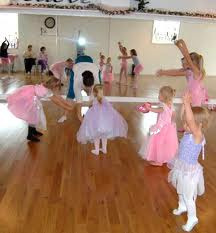 *Each Jazz lesson will be specially designed and age appropriate. • 1 hour of Jazz dance instruction incorporating both Jazz technique and choreography on Party Day. • Each girl receives Personalized CD to take home with 12 pre-requested songs to be played during the party. THEME #7 - Rock Star Diva Party: with Karaoke! Inside every one of us is a Star Performer waiting for an opportunity to be on stage. Let your child host a concert for their rock star friends. Guests come dressed as pop stars, and we provide the accessories; the bling and the glamour! Next, get those lungs warmed up because it’s time to become the next American Idol as the performers sing karaoke and perform on “stage” to their favorite karaoke tunes with glittering microphones, on-screen lyrics, and our Swivel Disco Ball Floor Light. And finally, all the divas (and dudes) will show off their singing skills in their own personalized show complete with award ceremony! *The karaoke songs will be age appropriate and will be selected ahead of time by the parent and the birthday girl! • 1 hour of entertainment including karaoke singing and preparing for performance. • Each girl receives a Personalized DVD to take home with the footage from the performance they starred in during the party. Drama party: Is your child born to be a star? Are they crazy for a particular musical like Annie, Grease, Hairspray, High School Musical etc.? 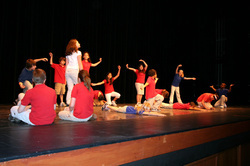 Your child has their pick of a popular musical theatre production. A theatre instructor will lead party guests in a reenactment of a scene and song from their favorite musical, while learning a variety of exciting theater techniques. The children will have a chance to perform their scene and song for their parents at the end of the party. *The musical will be age appropriate and will be selected ahead of time by the parent. • 1 hour of entertainment on party Ddy, which includes scene study, line memorization and a 10 minute performance at the end of the hour. • Each participant receives a Personalized DVD to take home with the footage from the performance they starred in during the party.